"Small Dollar" 1897 (Jan): Red Revenue $ 1 on 3 c. deep red, with stop after dollar, the famous unused example, centred slightly to left of outstanding fresh colour and delightful appearance, fresh and very fine with merest trace of three iron spots on the large part original gum. A truly exceptional example of this iconic stamp, a great rarity with just 32 unused examples recorded, many of the 32 have faults and staining whilst this is in wondrously fresh condition, being number 13 on the Kwang-sheng Huang listing (1983) and with excellent previous provenance. Signed Holcombe. Cert. 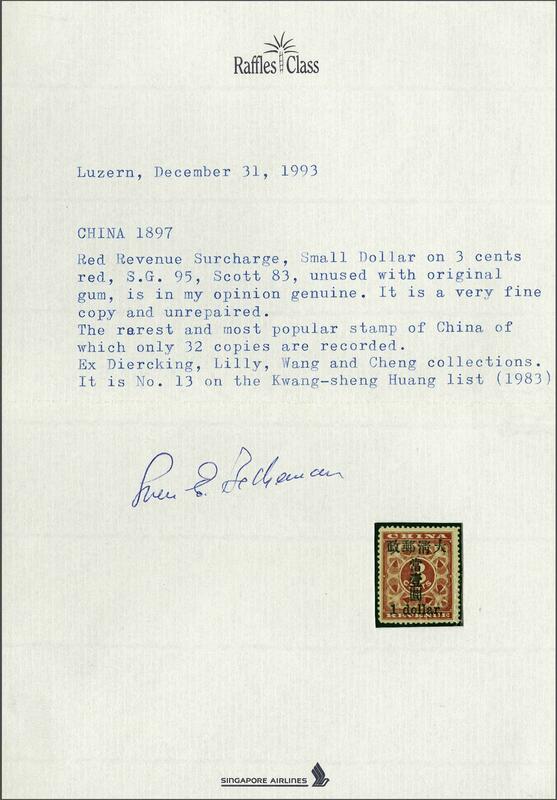 Sven Erik Beckeman (1993) Chan 86/Michel 33/I = € 800'000/Scott 83 = $ 900'000/Gi = £ 850'000.rnrnThis magnificent stamp is number 13 in the Huang Kuang Sheng treatise on the "Small One Dollar" and corresponds to reference 'III-5' in "The Revenue Surcharges of China 1897", Volume I, published by the Directorate General of Posts, Ministry of Communications of the Republic of China (1984); in this reference the Small One Dollars are split into three Types, this being 'Type III' with the overprint partly struck over 'REVENUE' at base, illustration number 5 on page 38. 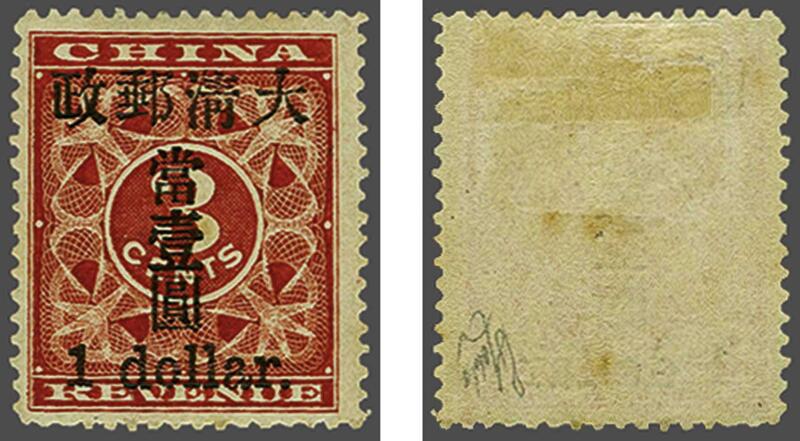 The original listing was done by the Chan catalogue in 1947 (page 50-51), where this stamp is listed as number 6 of the 23 then known examples; at this date Diercking owned seven of the 23 recorded examples. Whilst the catalogue listing follows the order by value, it should be noted that the Small One Dollar was the first of the 3 c. Red Revenues to be overprinted with 'Equivalent to One Dollar'. After a small number had been surcharged it was felt that the value indicated was too small for a high value stamp and the decision was made to use larger characters to indicate the value.rnProvenance: Collection Arthur J. Hind, Harmers, London, May 20, 1935, lot 133. Collection A. Diercking of Shanghai, Harmers, London, 5-6 November 1956 lot 212; Collection Josiah K. Lilly, Siegel, New York, 4-5 December 1968, lot 460; Collection 'Ming' Part II, Corinphila sale 79, 29 September, 1988, lot 4244.